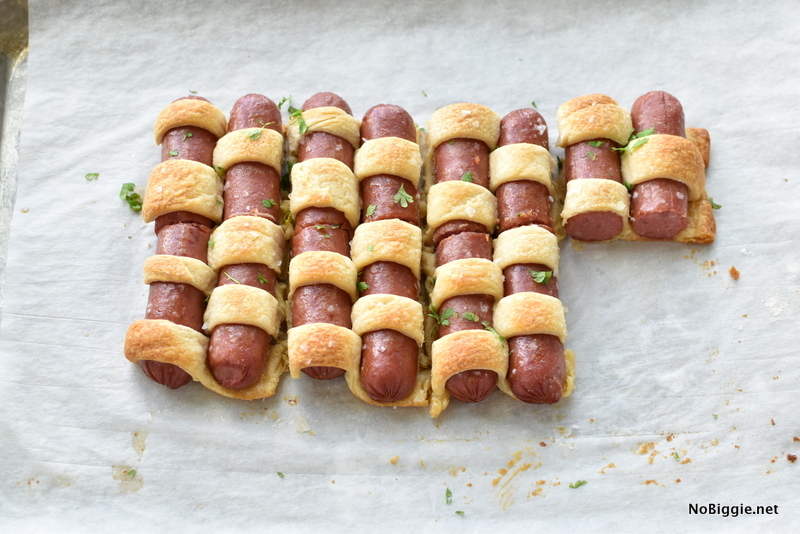 We are serving up a tried-and-true favorite: pigs in a blanket, only in a fun way…pigs in a woven blanket. 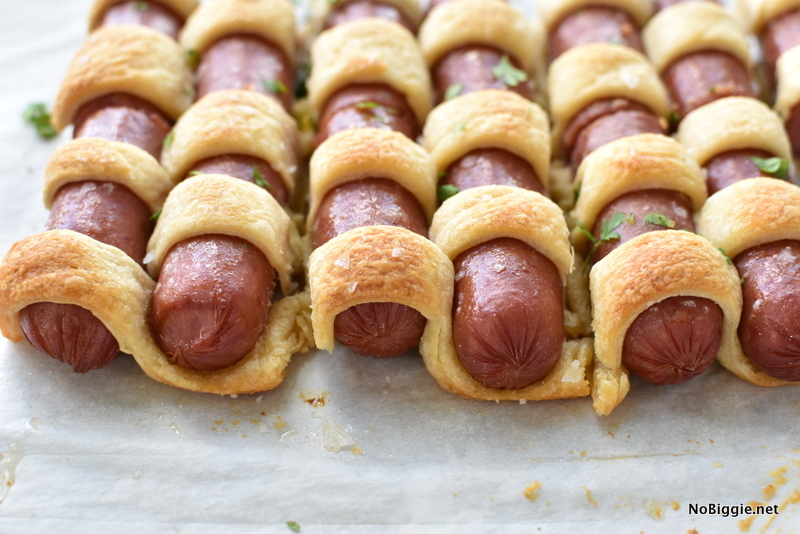 You can’t go wrong with pigs in a blanket, it’s a classic, people will always love it. You can serve it for dinner with cheesy chili or brush them with a little bit of truffle oil for a fancy dinner party. When you watch this quick video, you’ll want to make them like this all the time! Watch the video here to see how easy this technique is. Are you a fan of pigs in a blanket? It’s one of those things I forget to make, but whenever I do, my family loves them. On a lightly floured sheet of parchment paper, roll out the crescent roll dough into a rectangle shape, about 14x10 in inches. With a sharp knife, cut the dough into long strips. Fold back every other strip. 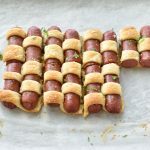 Place a hot dog on the flat strips, then move the folded strips back over the hot dog. Next fold back the opposite strips over the first hot dog. Add the second hot dog next to the first and then bring the folded over strips back over the second hot dog. 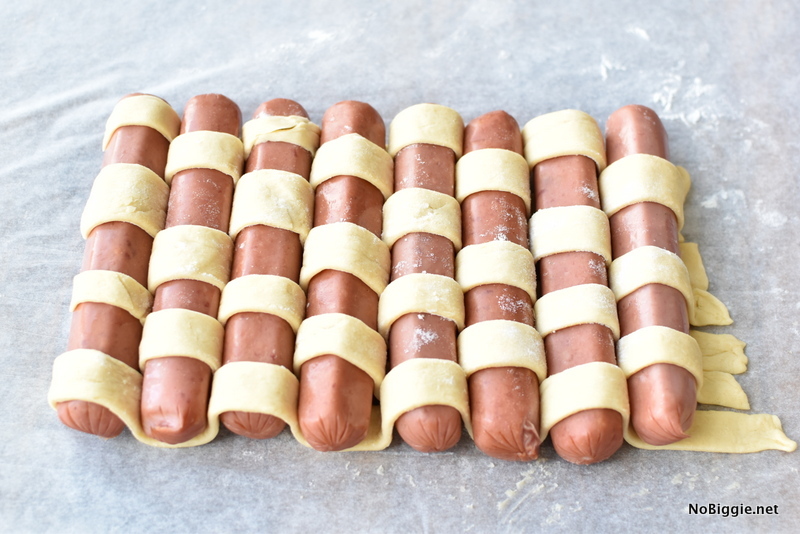 Repeat this weave pattern until all eight hot dogs are laying side by side in the dough strips. Move parchment sheet onto a baking sheet pan. Bake for 25 minutes at 375 or until golden brown. Let cool for a few minutes. Garnish with a little chopped parsley. Serve warm with cheesy chili or ketchup and mustard. I’d love to hear…what’s one of your favorite tried and true recipes…something that’s been around forever that you will always love?